October 28, 2012 Akira and experiencing Public Transport for a Wheelchair user. September 5, 2013 DPAC FREEDOM DRIVE. Oct 20, 2013 The DPAC action in Marble Arch . TUC March 2012. As a grassroots campaign group DPAC wouldn’t exist without the dedication of all those who give their time to exposing what is happening: coming out on the streets, writing reports, researching, writing web content and policy critiques, heading up and being part of the growing number of local DPACs, organising events, engaging with social media and a whole set of other stuff that keeps DPAC vibrant, active and strong – its thanks to you that DPAC exists. DPAC also want to thank the growing number of grassroots groups, individuals, academics, supporters, unions and organisations we’ve worked with in 2013. 2013 began with DPAC being awarded campaign of the year for our work in 2012 the year ends with DPAC being named as ‘people of the year’ by Owen Jones. In 2013 DPAC supported many local based protests on transport, the bedroom tax, ILF, local authority cuts and privatisation. We blocked roads protested against fuel poverty, fracking, the loss of legal aid, the bedroom tax, the closure of ILF and more. We set up Reclaiming our Futures 7 days of action joined by hundreds to celebrate the gains of the disabled peoples’ movement and to protest at the effects of imposed austerity on disabled people. 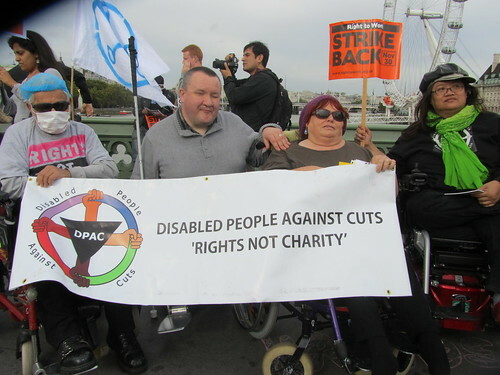 DPAC launched the UK Disabled Peoples’ Manifesto which was followed by an EDM.We also published a number of reports. There was cause to celebrate: the Government were ruled to have made the decision to close the Independent Living Fund unlawfully. Mental Health Resistance network succeeded in winning both case and appeal by the Government on the discrimination of the WCA. DPAC were approached by the UN prior to Raquel Rolnik’s UK visit to feed-in –her findings on the bedroom tax were devastating for the Government. DPAC led a whole range of events and join events on benefit justice to join together and fight the evils that this Government have imposed. While every protest, every campaign, every new network and every exposure of this Government is a success, we received growing numbers of emails from those left without money, food, homes and suffering cuts to their support. In 2014 we must continue to fight and take all actions we can to change and expose the devastation this Government is causing to disabled people. Key highlights of DPAC actions from 2013 below…. Co-op Campaign: stop the Atos Contract! Launched to publicise that Co-op were thinking of renewing a three year Atos contract for occupational health-Eventual outcome Co-op publically state they wouldn’t renew the contract with Atos. We publicised an update on the Bedroom Tax, unfortunately not rewritten by IDS or anyone else. The post by Frank proved to be an unfortunate prediction of what was to come. DPAC and Inclusion London hear heartbreaking testimonies from disabled people affected by the cuts. We send them to the special rapporteur on disability. It’s been a busy few days for DPAC gathering evidence on the cumulative impact of cuts on disabled people, and on the crisis in independent living. On the 25th we heard moving and powerful testimonies of how the Government are ruining lives through their austerity regime. Disabled people are faced with a range of cuts and so called ‘reforms’ which are contravening our basic human rights. We are faced with stark choices between eating or heating while having our dignity stripped by a range of psychological attacks at the same time as having support removed. Testimonies will be sent to the UN rapporteur on disability-thanks to everybody who came to London to tell their stories and to those that submitted their experiences through email. This event was originally arranged by Just Fair, however due to the rapporteur being unable to come to the UK due to illness DPAC and Inclusion London stepped in to run this at the last minute, so we could get these important stories out to the UN. On the 26th the morning saw a hugely successful protest on fuel poverty organised by DPAC, Fuel Poverty Action, the Greater London Pensioners and UKUncut: ‘Bring down the Big Six – Fuel Poverty Kills!’ against the increase in fuel poverty deaths and increasing profits and prices of the big 6. Supporting groups included No Dash for Gas, Campaign Against Climate Change, Climate Revolution, Young Friends of the Earth, Frack Off London, Power for the People, Barnet Alliance for Public Services, Lewes Against the Cuts, SOAS Energy & Climate Change Society and Southwest Against Nuclear. There were also protests in Oxford, Lewes and Bristol. 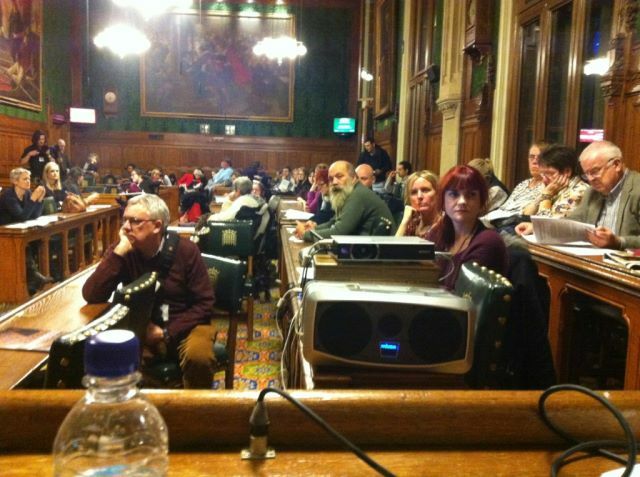 In the afternoon of the 26th the Emergency meeting on the crisis in independent living took place at parliament hosted by DPAC and Inclusion London. An event originally planned by Just Fair to launch their report to the UN rapporteur which DPAC and Inclusion London stepped in to run with a new focus on the crisis in independent living. This was in response to the successful appeal outcome at the courts on the Independent Living Fund-and the continuing awareness of the crisis for ILF users, those trying to access local authority support and the Government’s apparent non-compliance with article 19 of the UN Convention on the Rights of Persons with Disabilities. The afternoon launched DPAC’s report on the crisis in independent living and cumulative impacts of the cuts, one of many that DPAC is working on, as well as the film by Mary Laver an ILF user. The afternoon was complimented by speeches from John Evans and reflection on the past battles for independent living. We heard from the brilliant Louise Whitfield (one of the solicitors in the ILF case) and were treated to an excellent DPAC theatre performance which brought to life the reality of impacts on disabled people and the different barriers we face. Mike Penning ‘our’ new minister for disability was invited but did not respond or send apologies! Many thanks to all that attended, supported and worked so hard towards the afternoon-especially the many DPAC members and supporters that wrote to their MPs and publicised this. Some may ask why English national formal disability organisations with much more money and resources than us aren’t putting their energies into these types of activities all the time- we don’t have any answers or understanding on that. Join Fuel Poverty Action, UK Uncut, the Greater London Pensioners’ Association and Disabled People Against Cuts for an outrageous, creative and inclusive protest against fuel poverty deaths on November 26th at 11.30am in Central London. Meeting point – well it’s a secret, for now. On November 26th, the number of people who died last winter from cold homes will be announced. But we won’t stand for any more unnecessary deaths caused by price-hiking, polluting, profiteering, tax avoiding energy companies. So …join us as we take to the streets in central London to target one of the main energy robbers driving fuel poverty. As the Big Six energy companies hike up prices we are told the only answer is to put on a jumper, leaving millions of us to choose between heating and eating. While the energy companies spread the lie that ‘green taxes’ are to blame, we know that the real problem is the privatisation of our energy for profit and the skyrocketing cost of dirty fossil fuels. So bring your kids, neighbours, grandparents, your warmest jumper and your latest energy bill — and come join the fightback for the alternatives: warm, insulated homes and clean, affordable energy. It’s time to bring down the Big Six and put power back in people’s hands. Meet outside Royal Exchange by Bank Station for short march to destination target. See you on the streets. From 29th August – 4th September DPAC and other campaigns will offer a range of activities you can get involved in. These events will bring together our anger at what is happening now, and celebrate our victories won, both in the past and to come. Our rights are being stripped away day by day, by the neo-liberal policies being imposed on us all by the Condems, leaving us without much hope for our futures – or our children’s. the Physically Impaired Against Segregation) and on to DAN (Direct Action Network)- Now we have DPAC leading direct action and a host of other key grass root campaigns working towards reclaiming our rights and futures. We have fought our corner over 3 centuries. And those fights have brought victories; the Independent Living Movement, our early CILs (Centres for Independent Living) and early active DPO’s (Disabled Peoples Organisations) and the significant rights for disabled people (which are now under attack). They represent big victories, brought about by mobilizing in our communities around our common cause – and having the will and determination to see our demands met without compromising our rights. We have consistently united in anger and celebration. We will be launching the UK Disabled People’s Manifesto setting out our vision of how the resources, structures and institutions of our society today can be re-designed to empower disabled people to take part in life on our terms. Disabled people are, and always will be, the experts on our lives and our self-determination. It will be a vision and practical plan that we can take forward in our communities, workplaces and lives to reclaim our futures. In the build up to the manifesto launch, DPAC is leading The ‘Reclaiming Our Futures’, seven days of action to protest against the targeting of disabled people by austerity measures, to fight for our rights for inclusion and independence as equal citizens and to celebrate the value, pride and self determination of disabled people. The plan below is only half the story. We want YOU, your Deaf and Disabled People’s Organisation, your campaign group, your community, your friends to put on events and get involved too. Can’t get to our exhibition? – then put on your own. Can’t get to our direct action? – then do your own. Barbecues, debates, quiz nights, family days, picnics – whatever! ACT – in celebration or in anger! (PS don’t forget to let us know what you’re doing). Last year during the ATOS Games over 30 local actions took place around the UK Local actions mean you get to choose the target of your choice. You could take the Reclaiming Our Futures manifesto to present at your local MP’s constituency office, spread it through social media, protest on the streets against segregated education, the proposed ILF closure or show solidarity at your local Remploy site (for those few factories in their last weeks of operation). Alternatively, you might want to lobby your local Council on the Bedroom Tax and cuts to local services/support. Oh, and as we know ATOS offices are still around too….we’re sure you have other great ideas to add… Remember to let us know what you are doing so we can promote your actions. We will be producing local action resource packs but any materials you develop please send us copies to share with other protests and online. An exhibition and sharing of work exploring disability, art and protest followed by a ticketed fundraising gig run in partnership with Madpride and Tottenham Chances. Come during the day and join in our banner making workshop to prepare for the big Freedom Drive on the 4th September. If you would like to nominate an artist, collective and/or piece of work please let us know (including any links) and we will try to get them involved. If you want to do a local, street or online art protest too-this could be the day to do it. As government and the private sector increasingly use a so-called ‘modern understanding of disability’ to redefine who is and who isn’t disabled it is more important than ever that we understand, defend and promote the social model of disability. This isn’t helped when the social model is not fully supported within our movement. This event will be a chance to hear from a range of speakers and to discuss why the social model is still relevant today to our lives and our futures and to map out what we need to do to fight for it. The event will be live-streamed with the opportunity for people to participate in the discussion virtually. We will also be promoting a range of resources around the social model. Despite the huge efforts of thousands of disabled people throughout the country, it is increasingly difficult to find spaces where lies, inaccuracies and mis-use of statistics can be challenged. DPAC recently released a study into how the DWP uses all of these to vilify and demonize disabled people. A day of online action to reinforce that we want ‘Rights not Charity’, and a society where we are able to operate on our own terms as disabled people. Dare to ask for Rights not Charity. Dare to be an activist. Dare to ask more of ‘our’ organisations. We aren’t asking for Care, we want Power: Power to write the script for our own lives, and not to be written out or written off by others. A range of actions and captions will be available for you to capture in an image and circulate online. WE WANT EVERYBODY TO JOIN US FOR THE FREEDOM DRIVE ideally in person, but also online-this is for everyone everywhere. There will be accessible transport from a variety of towns and cities throughout the country (details to follow) and there is some funding available for transport but we will need your co-operation and patience to make this work for everybody, so please bear with us and note that while DPAC members will be given priority we want to support as many people as we can. If you can’t get there send a photo or your name and you can march with us. This week of action is yours. Please take part at whatever level suits you – BUT MAKE SURE YOU TAKE PART. Share our events, resources and actions as far and wide as you can. Let’s Reclaim Our Futures, together! Remember if you need help with funding to get to London (4th Sept) email us at mail@dpac.uk.net with details. DPAC members will get first priority but we’re hoping to be able to contribute to all that want to come along. If you are unable to come but would like your picture carried send us a photo or message. Please get in touch with any other queries as well and we’ll try to help. Reclaiming our Futures is supported by The Edge Fund, Andrew Wainwright Reform Trust, Network for Social Change, Black Triangle, Mental Health resistance network, Wow Petition, Fuel Poverty Action, Occupy London, TUC, UK UNCUT, Boycott Workfare, Right to Work, Just Fair, Unite Disabled Workers, BFAAWU, European Network on Independent Living, Anti-Bedroom Tax and Benefits Justice Federation, and more…..
On Saturday 20th July 2013, 12 campaigners from Bromley/Croydon DPAC, Campaign for benefit Justice, supported by Bromley Trades Council Members, held a demonstration to support UK UNCUT day of action against HSBC and highlighting that the world’s biggest bank is a profolic user of off shore tax havens, while the use of a food bank in the UK has increased 200 per cent in the last 12 months. HSBC Bromley Branch decided due to security reasons to close its doors to the campaigners and close the bank which was a victory for those campaigning as it was the intention to stop the bank from operating. So those gathered handed out leaflets on the HSBC protest outside the bank and raised awareness about HSBC and tax evasion, and yet in the last 12 months in Bromley 3,261 men women and children in the borough used a food bank, and those campaigning had a bucket for people to donate food to the local food bank for those in need. 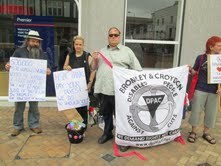 Two large buckets of food was donated in the afternoon protest which was delivered by DPAC to the local food bank in Bromley. Campaigning on the Bromley bedroom tax petition also continued during the protest, and 116 signatures were gathered in two hours. 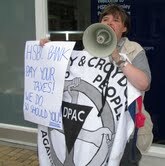 Well done to everyone who came along, Bromley HSBC was closed for the entire stuff the bank protest. Please see a couple of pictures from the demo on Saturday 20th July. Don’t let Atos be a winner at the Paralympic Games – join us for The Closing Atos Ceremony, the grand finale to Disabled People Against Cuts’ week of Atos Games. Atos are sponsoring the Paralympics, whilst wrecking disabled people’s lives. George Osborne has vowed to slash £18 billion from the welfare budget, regardless of peoples’ needs and ignoring the alternatives. To help them do their dirty work, the Government are paying Atos £100 million a year to ‘test’ sick and disabled people and decide whether they’re ‘fit for work’. But Atos’ Work Capability Assessments are driving disabled people to suicide and over 1,000 people have died of their illnesses soon after being found ‘fit for work’. The Government claim that the welfare system is being abused- this just isn’t true. Less than 0.4% of Incapacity benefit payments are fraudulent, but the government want to cut welfare spending by 20%. And instead of helping to get people into work; the government are closing workplaces for disabled people. The Government and Atos don’t give a toss about disabled people. This is about making ordinary people pay for a crisis caused by the bankers. It’s about making disabled people pay, instead of super-rich tax dodgers who cost us over £25billion every year. This is an ideological attack on the welfare state; these cuts are a political choice. But we’re fighting back. The nearest fully accessible underground station is Kings Cross. From there, catch Bus 30 towards Marble Arch or Bus 205 towards Paddington from stop R or A, and get off at Warren Street, bus stop V. BSL Interpretted event. This action needs you! Join for the afternoon, or come on your lunch break. There will be lots of ways to take part – hand out leaflets hold banners, or get involved in creative and daring ways. If you’re not in London, check the DPAC website for details and other ways to get involved in The Atos Games. Atos are making millions of pounds enforcing the government’s unnecessary cuts. It’s up to all of us to fight back, defend our welfare system, and demand the alternatives. Let’s show them that we do give a toss. See you at Atos HQ! In spite of implicit claims in the Brindle article1 that there is no ‘fight back’ disabled people have stopped traffic in Oxford Street 2, Trafalgar Square 3, protested against and closed the offices of Atos, protested online through blogs and social media, provided briefing notes and researched and gained significant victories in publicising exactly what is happening -both DPAC and Black Triangle hope they have been an impetus, along with the growing network of allies, user-led disabled peoples’ organisations and key anti-cuts groups across the UK and in Europe –all of us recognise the severe harm that the ‘cuts’ are doing to large groups of ordinary people. In the very first DPAC protest on 3rd October 2010 disabled people came together to lead the march against the cuts proposed by this Government, liaised with unions and other anti-cuts groups- it poured with rain, but DPAC were the first to have a synchronised online protest too. Disabled people saw a need for early action at a time when many formal disabled peoples’ organisations (DPOs) made few public statements on spending reviews or cuts and when the big disability charities remained silent. From the 100 or so original October 2010 protesters and campaigners –there are now thousands, overall numbers are growing at rapid rate- contra Brindle, disabled leaders are emerging in their hundreds trained by anger and despair at what is happening to their lives and the lives of others under this Government. The reality of the impact of the cuts on the lives of disabled people are much worse than any of us imagined on that rainy day in October: framed by an apparent media campaign in some sections to demonise disabled people as ‘scroungers (despite administrative error and fraud at 0.04 and 0.5% for disability support) 4, we have seen a rising level of disability hate crime, increasing suicides amongst disabled people 5, more and more disabled people relying on handouts from family and friends because they are being left without any income, disabled people losing their homes, disabled people with paid jobs seeing those jobs removed in a clear ‘cuts agenda’ 6, basic support from local authorities being cut to the bone, a move back to the threat of institutionalisation and away from independent living, and a move away from inclusive education for disabled children. are being told to seek work, and having income stopped. that the Government and its partner companies use to provide a bizarre focus on denying disability, impairment and ill-health each of which are being reconstructed as individual failings brought about by individuals adopting the wrong attitude-thinking yourself ‘well’ is cheap-it’s also impossible. The recent Dispatches and Panorama television programmes on the work capability assessment (WCA) and the regime used by Atos exposed what many of us have known for too long to a wider audience: a system designed to remove over a million disabled people from welfare support that has caused misery, anxiety and the premature deaths and suicides of an estimated 32 people a week. The WCA – a revolving door of Atos assessment, appeal, tribunal, and reassessment has produced horror stories of inhuman proportions. In one of the programs an Atos ‘assessor’ asked someone who had taken several overdoses why they weren’t dead yet. There are stories of people being forced to walk until they collapse and being declared ‘fit for work’ and those that Atos has signed off as unfit for work on employee schemes being declared ‘fit to work’ on the state schemes of cuts under the WCA. Atos have recently been awarded the PIP contract and are official sponsors of the Olympics. These are additional reasons why the Atos games: a week of activities for people to raise the issues of the inhumanity of these ‘tests’ and the callous removal of vital supports is happening. Atos decisions’ by Government, the continuing evidence and fight back for Atos assessments to be scrapped, the continuing legal challenges, the use of social media to spread information, undercover work with and by researchers, Freedom of Information requests and gains from empathetic media, lawyers, and MPs are all part of the ‘steam’-This is not being led by well paid Charity directors, nor as Macrae suggests by those who see themselves as victims but by disabled people without any funds fuelled by a raging sense of injustice and the will to fight back. The Atos games are an opportunity for all to show their anger at the disproportionate cuts being imposed on disabled people. They are an opportunity to mobilise against the carnage the cuts administered by this Government are causing. Disabled activists from as far away as Edinburgh and Cornwall descended on central London yesterday afternoon determined to make a space for their voices and concerns to be heard. With the utmost ease 20 wheelchair users were chained up across the road near Oxford Circus bringing the traffic in Regent Street to a total halt. The wheelchair users were supported by many more disabled activists with invisible impairments and supporters from UKUNCUT and Right to Work. A coach driver who was trying to take passengers to the theatre said he stopped at the traffic lights and then suddenly the coach was trapped and unable to move anywhere. Busses were backed up all along Regent Street for over 2 hours. It remains wrong that when tax evasion by the wealthy runs at £25 billion and neither the government or opposition parties make any attempt to collect this money disabled people, single parents and unemployed people are being made the scapegoats for the Condems savage and unnecessary austerity cuts. Disabled people heartened by the success of yesterday’s actions say this is only the beginning of renewed efforts on their part to have the Welfare Reform Bill overturned, and that even if this is passed their battle against it will continue. More information about the Welfare Reform Bill and how it will push many people including those working on low incomes into destitution and further poverty can be found on DPAC’s website together with a template letter which we are asking people to send to their MPs now asking them to vote against the Welfare Reform Bill in its current form. On Wednesday February 1st Condem MPs are planning to overturn democracy and vote to ignore amendments to the Welfare Reform Bill passed in the Lords. Please tell your MP this is wrong. We know that is much more at the local level with most local newspapers covering -Let us know if you find more …. with thanks to Steven Sumpter @latentexistance for national links and thanks to all that made this a success! After the starting point at Holburn, protestors stopped traffic at Oxford Street – from ITN News. Sam Brackenbury speaking into microphone held by Howard Jones. Disability campaigners have blocked one of central London‘s busiest road junctions with a line of wheelchair users chained together in the first of a series of protests against government welfare cuts. The demonstration – which brought much of Oxford Circus to a standstill for more than two hours – was the result of an alliance between disabled groups and UK Uncut, which has staged similar protests against corporations accused of avoiding tax. 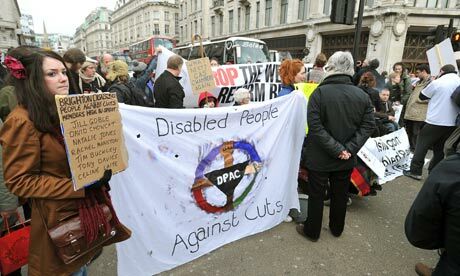 The protest was organised by Disabled People Against Cuts (DPAC), while UK Uncut provided advice on how to stage an eyecatching, media-friendly event and brought along several of its own supporters. The direct action began just before midday when a group of wheelchair users lined themselves along the northern edge of Regent Street, blocking traffic in both directions. The wheelchairs were chained together, and then chained to railings on either side of the road. Within about 20 minutes, with traffic stationary and congestion spilling over into other streets, around 300 people were standing at the junction, chanting, playing drums and waving placards against the welfare reform bill, which is currently going through parliament. After the road had been blocked for just over an hour, police asked over a loudhailer that the protesters move, which they refused to do. Eventually, at around 2pm, they unchained themselves and left voluntarily. Planned cuts to the disability living allowance under the bill could see 500,000 disabled people losing money, the charity Mencap said. Many of the disabled people taking part said they had never before joined a demonstration but felt angry at both the proposed cuts and the associated rhetoric from both ministers and the media. Josie, 52, from Hampshire, who asked not to give her full name, said her disablity, which has left her with limited mobility and near-constant pain, was caused by a fall onto a concrete floor at work 10 years ago. “I was doing three jobs until my accident and I was a keen hill walker,” she said. “But with the injuries from the fall I can only work part time. I’m probably going to have to give them up now because the cuts will mean I get less help. A Department for Work and Pensions spokesman said the government remained “absolutely committed to supporting disabled people”, spending more than £40bn a year on support. He said: “Households where someone receives disability living allowance will be exempt from the benefit cap, and we are giving local authorities an additional £190m over four years to ensure vulnerable people are supported through the housing benefit reform, so we are not expecting people to become homeless. “The introduction of the universal credit, from 2013, will see a simpler and fairer system of support for disabled people. Block the Bridge, Block the Bill. Today, some of DPAC supporters found each other at the UKUNCUT organised Block the Bridge Block the Bill demo. Report of the event can be found at Steven Sumpter (latentexistence)’s blog. More DPAC photos can be found at the flickr account.